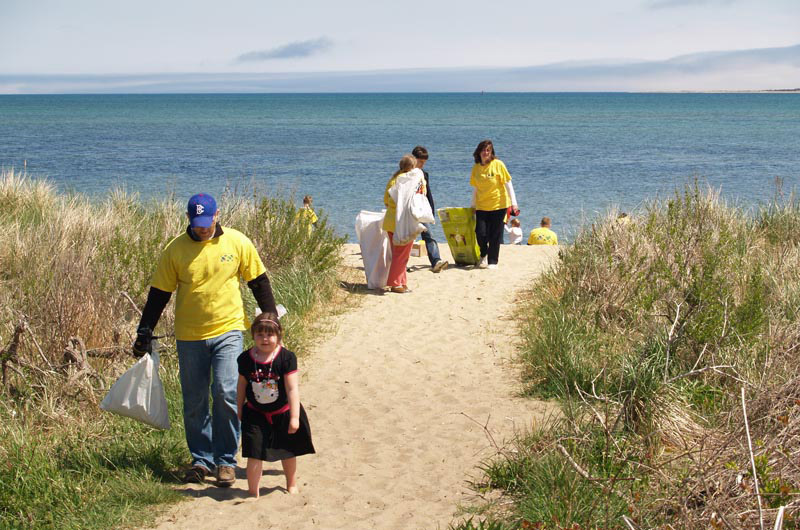 Volunteers will gather Saturday, Earth Day, to clean Island beaches. For the first time in years, Vineyard Conservation Society’s annual beach cleanup will fall on Earth Day. It also happens to be the group’s 25th consecutive year sponsoring the event, which began informally when Earth Day was first celebrated in 1970. People from around the Island will gather on Saturday morning to scour the shoreline for bags, bottles, lighters, fishing gear and other beach litter. VCS volunteers will be stationed at about 20 beaches around the Island, although any public beach is fair game. VCS communications coordinator Jeremy Houser said that after 25 years, many people already know the routine. To celebrate the nation’s first Earth Day in 1970, Bob Woodruff mustered about two dozen high school students to pull his oxcart along State Beach between Owen Park and Edgartown, picking up as much roadside litter as they could. The group only got as far as Trapp’s Pond before sunset, he wrote, but in a few hours they had filled the oxcart several time over with bottles, cans and other debris. Some notable finds over the years include an oven, a lawnmower, a tailgate, and a big-screen TV. VCS director Brendan O’Neill recalls finding a message in a bottle in 1997. VCS member Penny Uhlendorf contacted its sender, Jon Skillman, a former student at Newton North High School. As it turned out. Mr. Skillman had released about 2,000 of the messages as part of an experiment in tracking ocean currents in 1973. Incidentally, one of the messages had also reached Mrs. Uhlendorf’s son Karl in the 1970s. Mr. Houser said the amount of litter varies from year to year, and is likely influenced by the weather and ocean currents. A big portion gets washed up from other places, he said, with small plastic items among the most commonly collected. In honor of Earth Day and the 25th anniversary of the cleanup this year, VCS is stepping up its traditional after-party celebration at the Harbor View Hotel, with guest speakers Tyson Bottenus and Athena Aicher sharing their research on how to clean up plastic in the oceans. Mr. Bottenus is sustainability director at Sailors for the Sea, and Ms. Aicher is a research assistant at the Sea Education Association on Woods Hole. The party will include raffles and free T-shirts with artwork by Jules Feiffer. In keeping with tradition, MVY Radio will broadcast live from Eastville Beach. The even will take place rain or shine. For more information and a list of supervised beaches, visit vineyardconservation.org.